My brain is always churning. Thinking of a million different things at once. It's all quite annoying actually. But every once in a while, a gem comes stumbling out of the chaos. People obviously love sharing memories, and advertising who they have crushes on. But Tuesday has no major hashtag associated with it. Before you start, "Taco Tuesdays" totally transcends all this. It's bigger than the internet, so it doesn't apply here. Then it hit me. 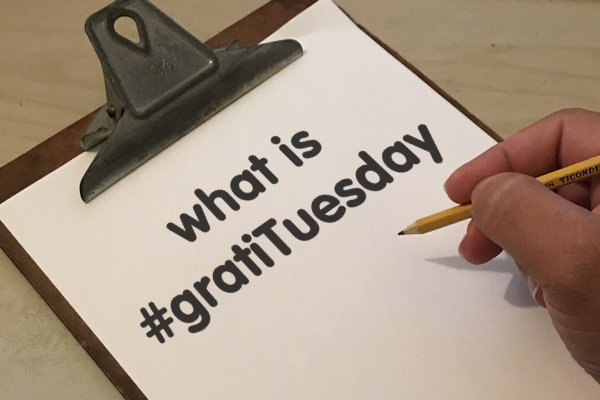 What if I combine "gratitude" with "Tuesday" to create the portmanteau hashtag... #gratiTuesday. A day that we can show our thanks and gratitude. I know that we don't get a chance to really show appreciation to important people in our lives as often as we'd like; so what if there was a day we can give thanks to the people, places, and things that influenced our lives. But not just the single day of Thanksgiving. 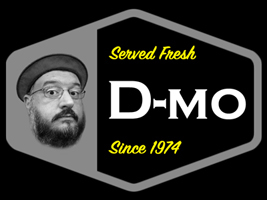 It should be something more... regularly recurring. Poking around the interwebs, I didn't see anything really related to this idea. There is an old, unused Twitter handle (@gratituesday) and Instagram shows that there are only about 20,000 posts with that hashtag, but that's about it. In my arrogance, I decided to make #gratiTuesday a thing. By "a thing," I mean that I hope people will see the hashtag at work, and take a moment to show a bit of appreciation to the people that played a part in their own lives. You don't have to post anything online, but you should send a note to that someone that you are thankful for them. Hell, I'll even accept a moment of quiet contemplation to think of the people who got you where you are. There are several inspirations behind this concept. One of them comes from Fred Rogers. Mr. Rogers was receiving a lifetime achievement awards at the 1997 Daytime Emmys. His acceptance speech is the stuff of legend. In case you can't watch the video, in his speech, Rogers wanted to thank those that got him there, but then made everyone in the audience take 10 seconds to think about the people that got them to where they are. Legitimately 10 seconds of silence and quiet contemplation. You can expect me to post on my social media, every Tuesday, a little bit of thanks to the special parts of my life. Because, truth be told, I'm lucky. A lot of things went my way, and many good tidings just fell into my lap. It's important to not take these things for granted. A little bit of thanks, appreciation, and gratitude goes a long way. 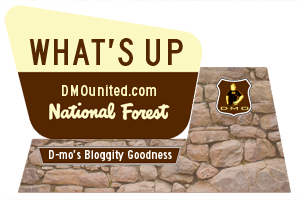 For today's #gratiTuesday, allow me to say thanks, to you, the What's Up @ DMOunited.com reader, for taking a little time out of your day and reading my words. I hope you will find them inspiring.